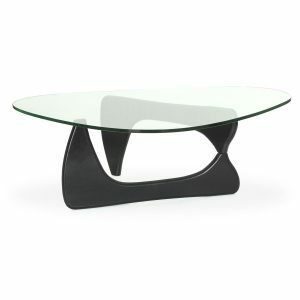 Inspired by Noguchi Table designed by Isamu Noguchi. Base made of natural beech wood. Tempered glass surface 15 mm thick. 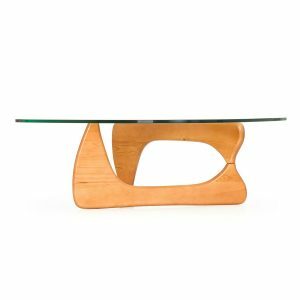 NOGUCHI Table shows the perfect combination between art and funcionality. The mixture of subtlety of the lines of the Eastern tradition with the practicality of Western modernity, have turned it into an icon of avant-garde furniture that continues to enjoy recognition after more than 70 years. The hollows forming the base, as if it were a piece of modern sculpture, provide a light and airy appearance which hides a strong and durable structure. 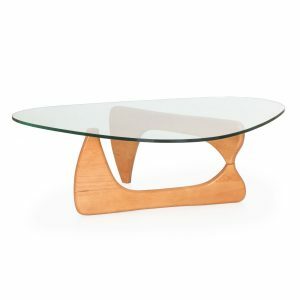 This coffee table consists of a triangular top of 15 mm thick tempered glass, which is supported by two curved wooden pieces.